All-Star Superman is an animated superhero film based on the comic book series of the same name by Grant Morrison and Frank Quitely. Released by Warner Bros. Animation on February 22, 2011. It is the tenth film in the DC Universe Animated Original Movies. Dr. Leo Quintum and his team are exploring the Sun when they are sabotaged by a booby-trapped genetically-enhanced time-bomb clone made by Lex Luthor. Superman stops the clone but in doing so receives an overdose of solar radiation; it has given him increased powers, but at the cost of slowly killing him. Luthor, having orchestrated the death of Superman while under the employment of General Sam Lane, is arrested thanks to Clark Kent's article and sentenced to death. Superman asks Dr. Quintum to keep news of his impending death secret from the public. Wanting to spend as much of his remaining time as possible with Lois Lane, Superman reveals to her that he is Clark Kent, but she initially doubts his revelation because she had been unable to prove Superman's "Kent" identity herself. Superman takes her to the Fortress of Solitude. During this visit, Superman's secretive behavior and her indirect exposure to alien chemicals heightens Lois' paranoia. She is startled by Robot 7, shooting it and then Superman with a kryptonite laser. The solar radiation having made him immune to green kryptonite, Superman is able to calm her, explaining his caginess was to hide her birthday present, a serum granting her superpowers for 24 hours. Now as a Superwoman, she and Superman stop an attack by Subterranosauri led by Krull in Metropolis just as Samson (who tricked Krull into leading an attack on the surface world) and Atlas arrive. After the Subterranosauri are returned to the center of the Earth, their leader Tyrannko states to Superman that Krull will be dealt with. Samson flirts with Lois and gives her a necklace, the crown jewels of the Ultra-Sphinx. When Superman tells him to back off, he shows Superman a newspaper that reads "Superman Dead" and challenges Superman to contests to win Lois. The Ultra-Sphinx travels through time to reclaim the jewels Samson had stolen, placing Lois between life and death. Superman must answer an unanswerable question to save Lois. The unanswerable question is "What happens when the Irresistible Force meets the Immovable Object?" Superman beats Ultra-Sphinx's challenge with the answer being "they surrender". Superman then defeats Atlas and Samson in a double arm-wrestling match before spending the rest of the day with Lois as her powers fade. Later, Kent meets Luthor in his death row cell for an exclusive interview. However, the energy in Kent attracts Parasite, who goes berserk. Clark stops him while not revealing his secret identity, with Luthor disclosing his respect for Clark as both a journalist and a man. Luthor then reveals a tunnel from his cell for Clark to escape through, aided by Luthor's delinquent niece Nasthalthia. Luthor chooses not to escape as the satisfaction of outliving Superman is rewarding enough. Clark tells Lois he's dying, before leaving to take the city of Kandor to a new planet to thrive, despite it being permanently shrunk, as he does not believe he'll survive the trip back. Lois denies it, speaking of their future together with their super-children. Clark informs her that their biology is too incompatible for them to bear children. Clark leaves with Lois promising to wait for his return. Two months later, Superman returns to find Metropolis has been repaired with Kryptonian architecture and that Earth has been protected by Bar-El and Lilo, lost astronauts from Krypton. They followed the trail of the vessel that brought Superman to Earth. To his dismay, the two have less altruistic goals and intend to turn Earth into a new Krypton. As they fight Superman outside of the Daily Planet, Bar-El and Lilo begin showing signs of illness: the two had passed through the remnants of Krypton and thus were saturated with Kryptonite. To save them and at their request, Superman places the two in the Phantom Zone until a cure can be found. After settling his affairs, Superman proceeds to finish his last will and testament. Luthor reprogrammed one of the Fortress' robots to steal the serum he made for Lois' birthday. Having the powers of Superman, Luthor's death by electric chair failed and he escapes unfettered. He meets with Nasthalthia below one of his lairs to continue his plans. Superman finishes his will when he learns of Luthor's secret ally Solaris; the tyrant star computer has betrayed Luthor by tampering with Earth's sun and turned it blue. With his robots, Superman engages Solaris in space. However, Solaris' raw power output vaporized all of the robots, with Robot #7 sacrificing itself to damage Solaris to redeem itself for being manipulated into stealing the super serum. All seems lost until Superman's pet Sun-Eater sacrifices itself to weaken the tyrant star, which allows Superman to destroy Solaris. Clark returns to the Daily Planet, very ill, and collapses upon completing his article, "SUPERMAN DEAD". When the staff tries to save him they realize that he has stopped breathing and his heart has stopped. But before they can do anything to help Clark, the super-powered Lex Luthor arrives and attempts to kill Lois. Clark revives and fires a gravity gun at Luthor. Superman tells Luthor that he has been on to him ever since Superman Robot #7 first malfunctioned. As his powers fade, Luthor briefly sees the world as Superman sees it and weeps as he gains a measure of understanding of the subatomic and how it interconnects. The gravity weapon has warped time causing Luthor's powers to burn out at a faster rate. As his powers drain, Luthor wishes the experience to continue. He believes he can solve the grand unification theory but when he reaches for his next vial of serum, he realizes that Superman has stolen his supply. Superman then destroys the serum over Luthor's protests, pointing out that if Luthor truly cared about solving the world's problems, he would have done so long ago. Luthor somberly admits Superman is right. With Superman's body starting to turn into pure energy, he and Lois embrace one final time and he proclaims his love for her once and for all. He gives her his cape as a way to remember him before he leaves and flies into the Sun, seemingly sacrificing himself to save the Earth. Later, when Lois sits on a bench in front of a statue of Superman, Jimmy invites her to attend a memorial service being held for Superman. Lois does not go as she believes that Superman is not dead and will return after he repairs the sun. Quintum visits Luthor in his cell. Now enlightened from his ordeal and accepting his impending death, Luthor presents Quintum with the only thing that could redeem him for his actions over the years....a formula to recreate Superman's genetic structure through a healthy human ovum. As Quintum leaves, he sadly muses "They always said they wanted children". The movie ends with a picture of Superman fixing the sun and Lois' voice once more stating "He's not dead. He's up there fixing the Sun. And when he's done, he'll be back". IGN gave the Blu-ray release a score of 7 out of 10, praising the visuals but stating that "there are too many threads, too many characters and too many detours down paths that don't amount to much in the end." ComicsAlliance criticized some of the changes made in the adaptation, specifically those which involve Superman killing or allowing others to die, but concluded by calling the film "a highly enjoyable picture, and one of DC's best offerings. The film earned $4,701,620 from domestic DVD sales and $2,397,723 from domestic Blu-ray sales, bringing its total domestic home video earnings to $7,099,343. The film comes in both DVD and Blu-ray and includes two bonus episodes from Superman: The Animated Series selected by Bruce Timm and a preview of the next DC Universe Animated Original Movie, Green Lantern: Emerald Knights. 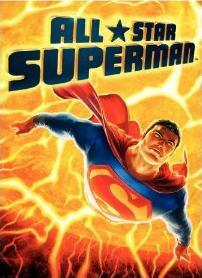 ^ "All Star Superman - DVD Sales". The Numbers. Nash Information Service. Retrieved 2014-08-24. ^ a b c d e Kit, Borys (2010-09-16). "Denton, Hendricks, LaPaglia lend voices to 'All-Star Superman' (exclusive)". Heat Vision. Archived from the original on 18 September 2010. Retrieved 2010-09-17. ^ a b c Harvey, James (November 30, 2010). "Press Release For "All-Star Superman" Home Video Release, Casting Details". worldsfinestonline.com. Retrieved December 1, 2010. ^ a b c d e f g h i j k l Harvey, James (February 15, 2011). "Cast And Crew Details For "All-Star Superman" Animated Feature, Contest Details". worldsfinestonline.com. Retrieved February 18, 2011. All-Star Superman on IMDb .